The Montessori teaching method is based on learning through multi-sensory experience, this theory has proven that children benefit from learning in this way. Originally developed in Italy the Montessori (1897) theory is now practiced in baby day care, nursery school and schools across the UK. The UK Governments Early Years Foundation Stage (EYFS) curriculum has acknowledged the Montessori’s approach. In their view this is at the centre of how children learn. Ofsted acknowledge the benefits of Montessori practice. Treasure Baskets have been used for many years by childcare professionals to support babies/children’s all round learning and development. Treasure Baskets support holistic learning, development and curiosity through touch, taste, smell, sound and visual stimulation. It’s a brilliant idea that works to stimulate and inspire exploration and discovery through multi-sensory opportunities. This enables children to learn, develop and build confidence through the decisions they make. When baby shows an interest in something in particular, for example sound, then it’s simple to add more items that support this interest. A length of metal chain sounds great rattled on a metal bowl. A wooden spoon to bang on a metal pan or a treasure basket. This is the brilliant thing about Treasure Baskets, they support baby/child to be in control of their own learning and make decisions about their play. 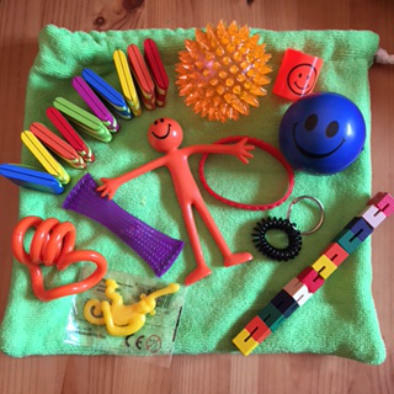 Activity Fidget Baskets and packs offer a variety of sensory opportunities. 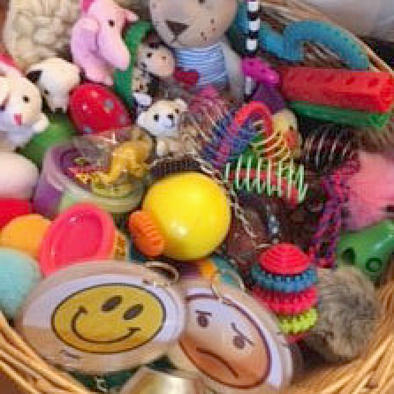 Sensory Treasures Fidget Packs/Baskets are designed to stimulate while supporting concentration, relaxation, learning and helping during anxious times. Suitable for individuals experiencing Autism, ADHD etc. They are suitable for all children and young people. Ideal for group activities in an educational setting, for using in nurture groups, or simply supporting children/young people to focus before teaching begins. Ideal for entertaining when travelling, shopping, appointments etc. They are especially good for those who find it difficult to deal in situations for a variety of reason. 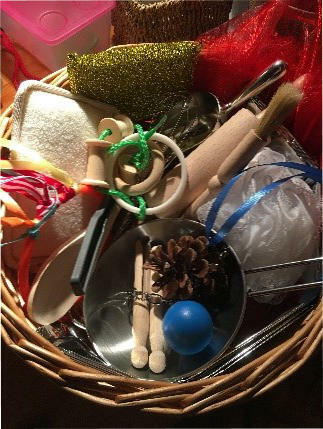 Fidget packs and baskets provide a valuable sensory experience. 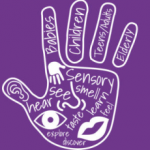 The Montesorri concept and way of learning can be transferred for older children and young people through use of Sensory Treasures activity packs. Supporting thinking, learning, focus and a sensory preferences. Our Fidget packs come in a drawstring bag making them accessible, easy to transport and to take out on trips etc. Fidget Baskets come in a good quality wicker basket,that can be added to if and when needed. For more information, to personalise, arrange a consultation or to order please complete a bespoke form.